It’s Cinco de Mayo. The fifth of May. I feel like this recipe should be something from a different theme… It seems that the holiday snuck right up on me and happened to be smack dab in the middle of burger week. What’s burger week? Glad you asked! 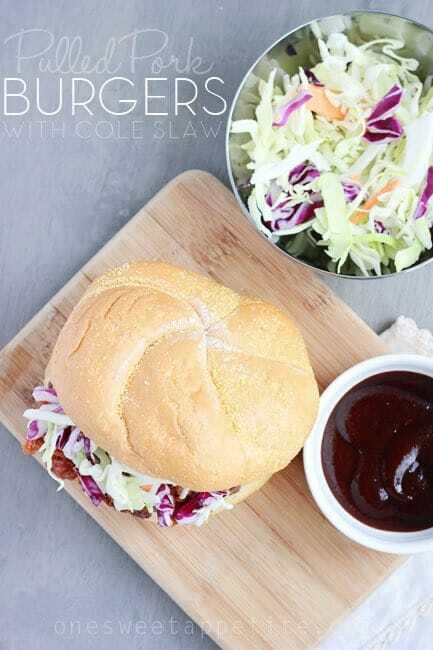 I’ve teamed up with my dear friend Yvonne from the blog Tried and Tasty to bring you one whole week of burger recipes! Five days. Ten recipes. 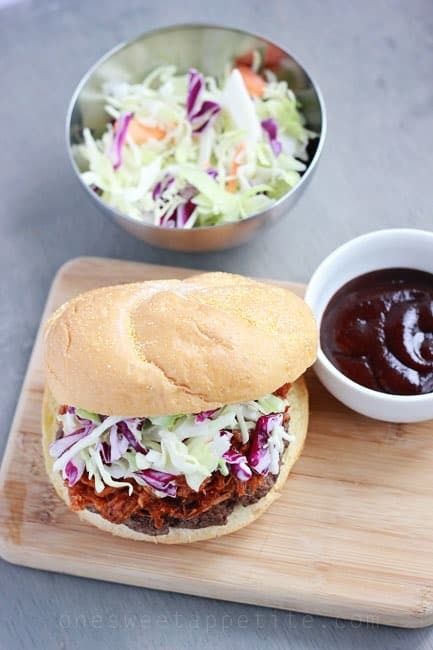 Starting with this BBQ pork burger with coleslaw! I have a wonderful pulled pork recipe. It didn’t take me long to pair it up with a juicy burger patty. The cole slaw addition was inspired by some tasty meal I saw on Triple D. Any Guy Fieri fans? Those frosted tips take me right back to junior high. I can remember when everyone had to have the bleached hair and spiked in every different direction. But I am getting off track. Let’s get back to this recipe. 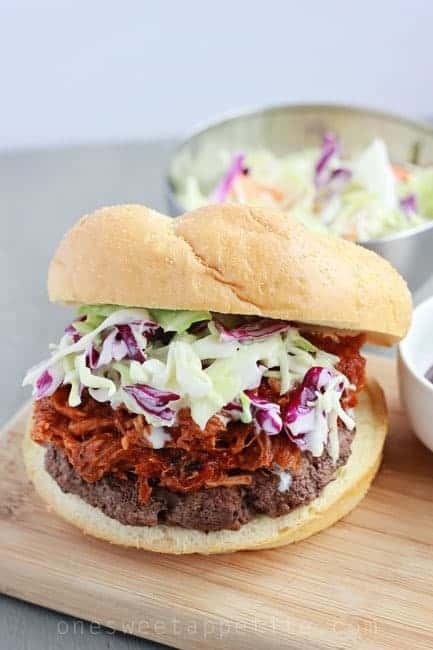 The pulled pork is slow cooked all day, the cole slaw takes a few seconds to whip up, and the burgers are so simple to cook. Top with a few fresh pickles and you are golden. 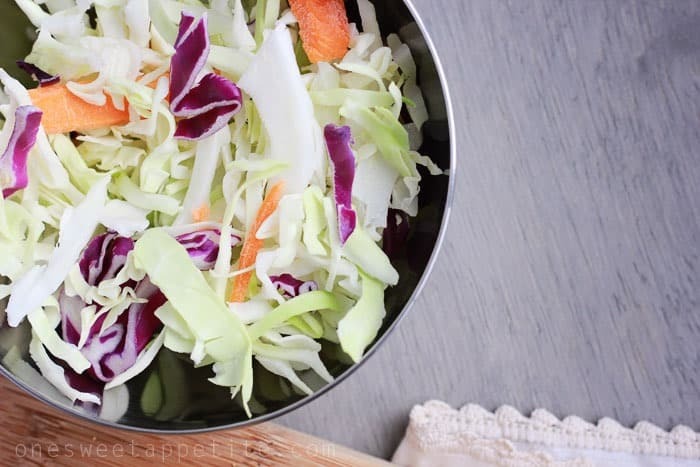 Mix together your coleslaw mix, mayonnaise, sugar, milk, vinegar, salt, and pepper. Refrigerate until ready to use. Heat your ovens broiler for 5-10 minutes. Line a baking sheet with foil and set aside. Divide your hamburger meat in half and shape into patties. Sprinkle with salt and pepper if desired and place onto your prepared sheet. Cook 8-10 minutes making sure to flip halfway through. You can get the pork recipe here. Great thing about that is you can make a giant batch, divide it into bags, and freeze. Nice for these burgers, regular sandwiches, or even some pulled pork nachos! NOW, head over to Tried and Tasty for the first burger in her series! Unlike me, it’s perfect for any Cinco de Mayo celebrations you might be having! I’m wishing I had that queso for breakfast this morning! CLICK THE PHOTO BELOW! Queso blanco cinco de mayo burgers from Tried and Tasty! This looks so delicious – great way to kick off burger week! Can’t wait to share all of the fun recipes we have in store! Pinning! Wow! That is quite a burger. Looks delicious and yes, the frosted tips hahaha! Headed over to Tried and Tasty! I am always a little nervous to do coleslaw, but I know if it is one of your recipes, it has to be good! Oh my goodness! This looks so delicious! Pinning! We are pretty boring burger makers. I think my husband would love trying something new like this. This looks yummy!! I can’t wait to try it. This looks absolutely wonderful. My stomach is growling! I’m loving burger week so far! And pulled pork SO belongs on a hamburger! Love it! Can’t wait to see what else is in store! Pulled pork, coleslaw AND a hamburger?! What a fun idea! I would definitely be interested in giving it a try!